Last November I was cleaning my bedroom. The house was silent, children sleeping, Jeffrey in his office, and snow drifting like a dream. It was around midnight, and I was very hungry. I decided I needed a pot pie. Because when it is dreary outside there is nothing better than comfort food. The warmth infiltrating your body, driving back the the cold, defeating it. The comfort of the potatoes and pastry filling the belly, comfort and warmth and happiness that only hot foods in cold months can bring. I popped it into the oven, and then went back to cleaning my bedroom. I forgot about it briefly, and was suddenly brought to my senses by a loud and continuous beeping. My oven was yelling at me. My pot pie was singed, charred, and sad. It didn't look a complete and total loss, though. I dumped it out onto a plate, after unplugging the oven, and took it back to my room to finish cleaning and watching Dirk Gently's Holistic Detective Agency. Because I love the book. But I digress. I sat down to enjoy my slightly overdone meal, fine with it because I've had slightly burned food before. I don't know if it was from the excessive smoke or what, but this food had an incredibly acrid flavor to it. I figured it was just from being in the oven too long or whatever. But I couldn't eat it. I got sick the next day, and figured that is what was wrong with the pot pie. I was just sick, so things tasted off. But my oven, it was never the same after that day. It would randonly turn off. We would be baking something in it, and it would just turn off, out of the blue.It was so frustrating, because it took 3 times as long to bake, but I could still bake in it. Until one day when I couldn't anymore. It would turn on, it just wouldn't heat up. That was about a month ago. Which was really sad, because I had just gotten a bunch of rhubarb for rhubarb pie, and suddenly I couldn't use it. It was a very sad day. But we did have a microwave in storage somewhere, so we could manage. And the stove part still worked. That was about two weeks ago. The burners would suddenly turn off while we were using them. It was quite frustrating, because sandwiches get old fast. Jeffrey wanted to just go straight out and buy a new oven, but I couldn't justify that. Because what if it was a $100 fix? And we spent $500? That would just be ridiculous. I convinced him we needed to call a repairman, because I was convinced we just needed a new heating element, and I found one on Amazon for $80. Except when the repairman came, he took the back off, and showed me the control board. It was black! As in it had been singed or melted or something. I asked him how that could have happened, thinking back to my burned pot pie, instantly feeling culpable. He said it is usually from faulty wiring or a power surge, it couldn't have been from something I had done. I was awash with relief! However, for a new part and labor it would be $375. More than half the price of a new oven. We tried to look up the price on Amazon, but decided it would just be easier and probably safer if we just got a new one. Because who know if there was actually something wrong with the range and we got a lemon, and we would end up paying more in repairs than in the long run. And so we went on a long hunt for a new one. Jeffrey and I had many long discussions about the new range. Because I have many definite opinions about what kind of range I want to cook on. I wanted another convection oven, because I love that for baking my bread, but after the car repairs we had to make, I figured it was out of my reach. 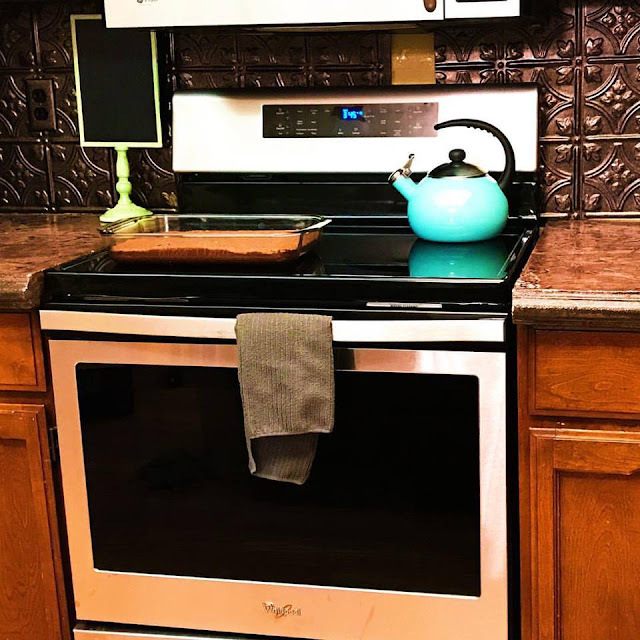 I just needed a glass top because I did NOT want to have to clean those burners, or underneath the hood of the stove. I had grown up doing that, and watching my mom doing that, and knowing I would be so incredibly busy with 5 kids very soon, I just didn't want to deal with that. And when I lamented the loss of self cleaning, but accepted it, Jeffrey was an absolute peach and said it was fine, we could get self cleaning because trying to clean around that door is a pain, and he is a sweetheart and wants to make things easier on me if he can. Which is why he is such an absolute stud, and I just love his guts! He got a little frustrated with how picky I was being, and decided to just turn it over to me. Which was fine, because I was going to be the one using the oven the most, so it made sense that I got to pick it out, right? And so I scoured the web for all the usual places. Home Depot, Lowes, Sears, etc. I found one I liked that was in our price range at Lowes. Except there was a haul away fee for them to take our old broken range. And then there was a delivery fee. Not to mention the fee for the cord. And the adapter because they for some reason it needed an adapter. I don't really understand that, but whatever. And by that time, it was a bit out of our price range, and I was annoyed. I said a quick prayer that I could find the one I wanted, and I thought to look at RC Willey. But that story is found here. Needless to say, I got everything I could ever have desired in my new oven and I was thrilled beyond all reason! Friday morning they delivered it. All stainless steel and black and alluring. I promptly named it Julia. Like Julia Child, because it is going to help me create masterpieces! However I will call her Jooles for short. I was going to take it on its maiden voyage to bake Lunch Lady brownies. When I turned it on, though, it started to smoke. I looked online and I was told to go out to eat while cleaning it out because the smoke and smell were a bit much to handle. And that brings us up to date. Keith was at Avery's house, and so Jeffrey and the kids and I went out to eat at one of Jeffrey's favorite burger joints. We were sitting happily, eating our dinner and lamenting Keith's absence. It felt so weird to not have him with us. The conversation was incredibly different, for one. Also, Beth wasn't screaming because he was teasing her. I don't really understand why he picks on her so much but my goodness, he is not nice to her a lot of the time. Except when he is, and then he is the sweetest kid in the world. The girls were eating their ice cream, Vince and I were sharing fries, and Jeffrey was lost in thought. I turned away to remind Beth that she really needed to eat her food before her ice cream, when I turned back to Vince, he was playing in a puddle in his chair. It took few moments before I realized that his puddle was not the same color of anything we had ordered, or anything on our table. And then Faye commented that it smelled bad where we were sitting. I whispered to Jeffrey that he needed to get Vince out asap. Before we had left, I had thought to pack a new pack of wet wipes. What a blessing that was! Jeffrey took Vince and the girls, and I cleaned up our food, and then went to town on his highchair, and the floor. I then had to make a shameful walk up to the register and whisper to the poor teenagers working there that the highchair we had been using most likely needed to be disinfected, and I was terribly sorry. The girl was so sweet, said it happens all the time, and then took the chair into the back to clean it up. And I went outside and helped Jeffrey get the kids buckled, and we picked up Keith. We got home, and walked into the house. It was a sauna. Except that is an understatement! Saunas, while hot, are wonderful and relaxing and feel amazing. They are intentional. And they don't smell so awful that your lungs burn, or your head aches. But that is how my house was. We had turned the AC off, opened all the windows, and turned on some fans, but it didn't seem to be doing much to help. We sent all the kids downstairs, and we followed them. It felt amazing down there! It was nice and cool, and I may be completely in love with my basement now. Nothing has ever felt so wonderful. Like a cool dip in a pool when you are dripping with sweat. Or lemonade in the shade with a cool breeze during Summertime. It was fantastic! It was decided that we would stay down there for the night. Except Vince and I would sleep in my bed, and Jeffrey would be down with the other kids. My bedroom door had been closed all day, and so while it was still hot, the smell was mostly out, but it was hot. By morning, the smell was mostly gone, though, and we closed the windows and turned on the AC. Sweet relief! I may have stood above the vents in my skirt for a full cycle of air. I really pity people who live without central air during the summer! The one sad thing I have realized about my oven, though, is it really heats up the house to use it. My other one didn't at all. I could put the self cleaner on, and it would scarcely raise the temperature in my house. This oven, even baking something simple raises the temp in the house. Sigh. I will miss that feature of my old oven. But, I think it will be glorious come winter time. I will get to do all kinds of baking because that is what I enjoy, and it will help to keep the house cool in the winter. I wont be pregnant when it gets cold. I will no longer have this lovely internal heater going on that is so difficult during the Summer, but amazing in the Winter. And that is the continued story of my oven. Let's see, I failed to mention that last Wednesday Jeffrey took the girls to the grocery store with him, and immediately returned. Faye had been stung by a bee on her eyebrow. Yesterday Keith got stung on his foot. I am so grateful for baking soda! It seems to have taken the sting out immediately for both of them! Vince is still sick. Even today he still has been having the leaking poopy diapers. I went to 9 o'clock church so I could take the sacrament and then came home so Jeffrey and the other kids could go to church. We just can't really take Vince out right now for fear of a repeat from the burger joint. It will sure be nice when he gets well from this, that's all. While Jeffrey and the kids were at church, I got Vince to sleep, and then decided it would be lovely for them to come home to a hot meal. Because everyone is always hungry after church, and we are all out of sorts until we get food in our bellies. I rummaged through our cupboards and found some pasta and sort of half followed a recipe half made it up on my own. It was delicious! And when the family walked in the door after church, the house was aromatic and cool, and perfect. Everyone sat down, and we ate lunch. Jeffrey asked where I got the ingredients for lunch, and I laughed at him. Silly boy, I got it all from our cupboards and the cold storage room. I have missed cooking. He decided to take over cooking several months ago in hopes it would help to alleviate stress from me. While it did do that, I really miss creating concoctions and delicious masterpieces. Maybe now that I don't have 7 kids all day every day I will be able to do more when it comes to cooking. Either way, it is a new adventure. A new oven, and a new found freedom. The sky's the limit!